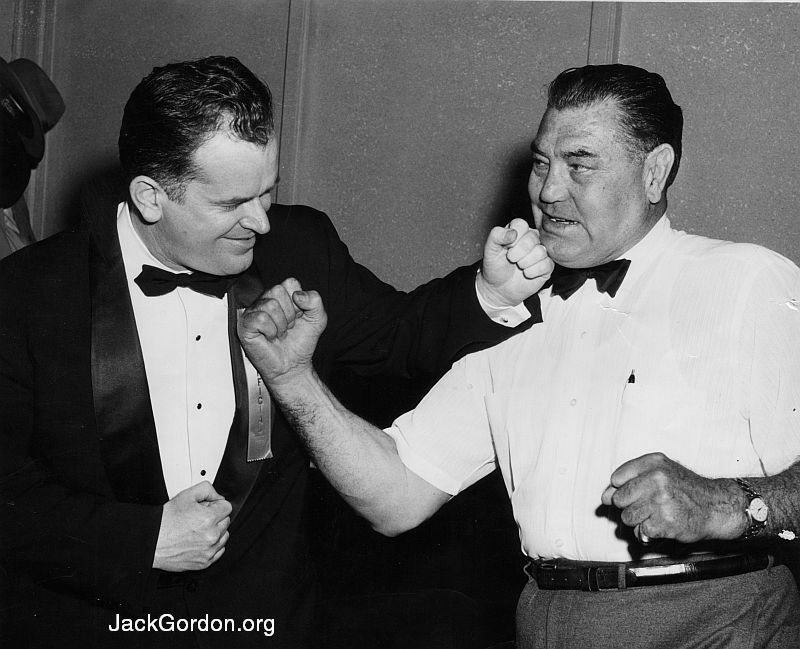 In an undated and unfortunately uncaptioned photo, we see Jack Gordon, Greater Seattle, Inc., landing the first punch on the jaw of former world heavyweight boxing champion Jack Dempsey, the "Manassa Mauler." Asked about this photo in the summer of 2010, Jack Gordon said he remembered Dempsey serving as Grand Marshal of a Seafair Parade, but I was unable to find any record of it. Gordon was proud of the fact that, according to this picture anyway, he "got the first punch" on the World Champ. According to a story at 'Sports Press NW', Dempsey was in Seattle as the guest of honor at the 1951 Sports Man of the Year event. In the shot of Dempsey on that page, he looks about the same age as he does on this page. Jack Gordon would have been 29. I know that Gordon emceed the Man of the Year event for Brougham for a long time, but I'm not sure when he started. There might be some mention in the Press Club magazine.